Blooming Desert’s design team has designed and constructed thousands of projects. Every project is unique. Great thought, organized in an appropriate fashion for a coherent and exact production of the documents, is paramount for a seamless project. Webster defines architecture as “the art or science of building specifically.” This is where intelligent, creative thought must give way in an organized fashion to those that build. We realize that to be great in one area but average in another is not excellence. Our design group, operational team, and construction division specialize in “custom-scapes.” We consistently build the extraordinary. Though subjectively anyone can use words such as “premier” or the “best,” reality grades us all. We have an extensive history of designing and constructing in excellence. Due to the nature of our projects we carry some of the largest residential licenses issued by State of Arizona. We carry a General Engineering License, Dual Masonry License, and Dual Landscape License. Though carrying a particular license does not guarantee the competence of the contractor, it is a gate keeper and can help identify what the contractor’s scope is under Arizona Registrar Ruling. 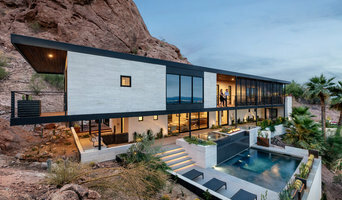 Boutique Architecture & Interior Design firm offering creative solutions throughout Arizona and USA with consulting and design for projects the world over. We are focused on dynamic design solutions for today's modern world and specialize in thoughtful Residential and Commercial project designs. Principal Architect Jeffrey H Page offers over twenty five years’ experience creating stunning modern designs for Residential Homes, Vacation Villas, Boutique Hotels, Luxurious Island Resorts, as well as New Office Buildings, Apartments, Retail, Automotive, Health Spas, Art Galleries, Restaurants, and of course Green Sustainable Master Planning and other creative services. SpaceLineDesign Architects have created projects throughout New York State and since 1996 in Phoenix Arizona, with several projects published locally and internationally. ******************* Since 2008 firm partners Jeffrey and Mahsa Page lived in and worked for international design firms in the dynamic architectural hub of Dubai, UAE. We have since been providing Architectural and Interior Design and Project Consulting to a growing collection of design focused clients and can now showcase projects in over 10 countries. We continue to expand upon our unique design style and growing collection of daring custom design, influenced by today's modern, sensible design aesthetic.